If I were to write an article about Obama's new slogan. FORWARD, it would have looked just like the one published in FrontPageMag.com by Daniel Greenfield. So all I had to do was illustrate it. 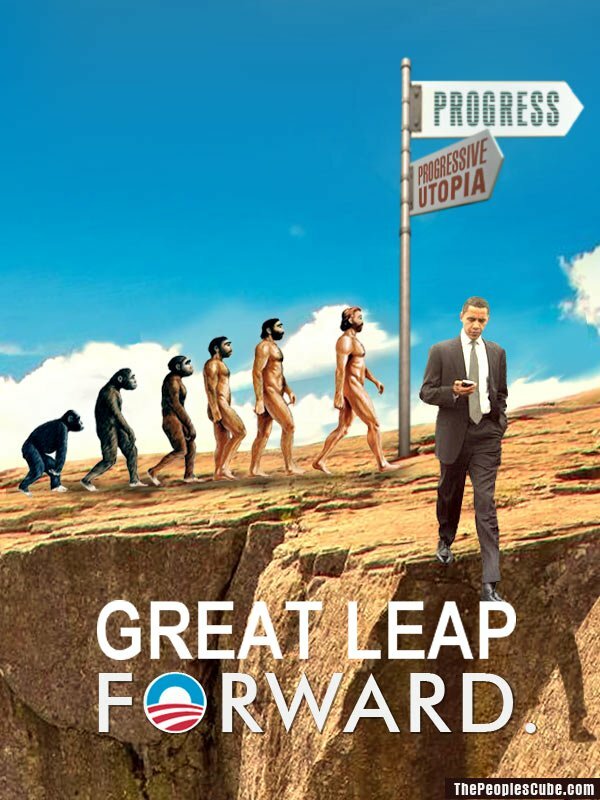 The Obama slogan for 2012 is in and it's "Forward." The left has always been enamored of "Forwardism" or "Progressivism" which mean much the same thing. Before MSNBC had "Lean Forward," Mao had the Great Leap Forward, which killed some 40 million people, far more people than MSNBC can ever dream of tuning in to their programs. When Lenin wanted to launch his own newspaper, he called it, "Vperod" or "Forward." The name has popped up on the mastheads of left-wing newspapers across the world. It's "Vorwarts" in Germany, "Voorwarts" in the Netherlands and "Ila al-Amam" in the Arab world. Back in New York it's "The Forward." There are any number of left-wing political parties who have named themselves "Forward", including the Forward Communist Party of India, Kadima, the left-wing opposition party in Israel, and Vperod, a Russian political party that split off from the Socialist Resistance on account of the latter not being radical enough. Picking “Forward” as his campaign slogan puts Obama in good company with Lenin and Mao, and it sounds positive until you stop and realize that it’s meant more as an order than a suggestion. There’s a reason leftist newspapers with that name add an exclamation mark at the end of it. It’s not a proposal, it’s a command. Lean forward, march forward, live forward and then die forward. We’ve burned the bridges, run up the deficit and trashed the economy so there’s no going back. An old Soviet era joke told the story of the wife of a Communist leader who upon hearing that her husband had developed a progressive paralysis, clapped her hands and exclaimed that at least it was progressive. That is the underlying message of “Forward” to voters: the country may be paralyzed, but at least it’s a progressive paralysis which leaves us unable to move our heads and stop leaning forward. Wasn't "Vperod k kommunizmu" a Soviet slogan? It's amusing to me that the Left is such a vacuum of originality, so bereft of new ideas and intellectual vigor that even when they try to capture imaginations and spirit all they can muster is the same old tired cliché poppycock of the past. If they were science fiction writers their stuff would have the same ideas and plots as the pulps from the '30's. Those people got no there there. )-WNWARD !" would make an AA+ bumper sticker,comrades. DOWNWARD point the shovels, in our glorious new, shovel ready careers! DOWNWARD with the bourgeois notions of the superiority of an AAA credit rating. DOWNWARD with the purchasing power of that capitalist tool, the AmeriKKKan dollar. Here's a nice one from the Nazis, too, like Herr Red Cube states above, "Vorwarts." March, Comrades, Occupiers, Unionized Workers, MARCH! http://www.youtube.com/watch?v=l_z_pHUK ... r_embedded	...I see Laika already found this one and posted it days before me. Curse you Laika and your time machine! The proletariate will not only bend over backwards for His Excellency and The State™.... they will also bend over FORWARD, as well! Pelosi forward, abortion on demand (or forced). The Aztecs had it right. Capitalism is failing. Be sure to keep us posted on the people's media, Facebook's Billion Dollar IPO while wearing your $200 Ray-Bans. I wonder how Castro feels about "Forward"? We got smart too late? Will Americans now be swimming to the people's paradise of Cuba to escape the misery of the United States? The blatant use of Marxist icons and tactics by this administration just boggles the mind. It is as if they are just seeing how much they can get away with. Oh yea, have no idea who made this awesome Rosa Klebb avatar, but I have appropriated it for the people. Desiring to be mindful of the lack of wisdom in seeking to "improve" a masterpiece but with a mind insufficiently attentive to such wisdom, I've added something to Red Square's masterpiece but with the understanding that he will either delete it or replace it with a superior version as soon as convenient regarding President Obama's "FORWARD" slogan to show how it has been suitably and traditionally described in world-wide Collective Wisdom as the "GREAT LEAP FORWARD." Perhaps this could boost sales of what is, in effect, the Cube's "Little Red Book." Wikipedia reference to Forward being Commie slogan scrubbed. And select Van Jones or Tavis Smiley as the next VP. There is no sense in keeping Biden after causing Dear Leader to "flip flop" on the gay marriage issue prior to the election. Frankly, flip flopping should suit double agent president flexibility. The newspaper took its name from the German comrades. In German it is Vorwärts, and reads more or less like Four-warts. Great! The victory is ver near, dear komrades! Forward is the very first word of the always great, always glorious and always korrect kommunist chinese anthem, and we Obamerikans should look forward to adopting that glorious entire anthem soon. Everything has to have a beginning. Why not begin with the beginning? Warmest Greetings from the future North Amerikan Province of the PRC! One I haven't seen yet is people with yokes around their necks like oxen and Obama on the wagon holding the leash and pointing. If I was graphically literate I would do it myself. It's easier with a Mac korrect? More additions. Obama as Xerxes from 300: "I require only that you kneel"
BTW, Vorwärts is German for Forwards, and reads like Four-warts. We don't want it FORWARD! We want it BACK! It's been awhile since I goose-stepped these steppes. Here's another look at Obama's new slogan. Anyone interested in a bumper sticker or a shirt? Speaking of dyslexia... FWORD, comrades! FWORD! Back where? Back to those evil and oppressive 1950's? Didn't we also want it "back" when our prole Cindi Sheehan was screaming about the wars that are still going on? Where did we want it back to then? 1969? So if Forward is 1968 and Back is 1950 couldn't we reach a compromise with the wingnuts for the 1970's? I sure do miss my Disco Ball. You don't say? How about a little FWORD: http://redcube.spreadshirt.com/fword-fo ... -I11950010For The Children™. I was actively appalled by the content of this page (which makes pathetic attempts to compare our brave, righteous, and awe inspiring leader to mortal men and their fallible slogans), until I saw CHOOM. Comrads, is there an FWORD banner we can use as the cover photo for our facebook pages? I tried using this one, but it is not the correct size. Comrade ROCK - it was very equal of you to make this! Thank you! Democrat Victory A Great Leap Forward To Workers' Paradise!